The vibrato circuit card can be found on the bottom side of the hinged drawbar board. It is located in the space between the drawbar assemblies for the upper and lower keyboards. The vibrato board has two circuit board mounted controls. The left flat mounted potentiometer adjusts vibrato speed. The right flat mounted control adjusts vibrato speed. The circuit card has ten pins that plug into a matching ten pin socket in the organ chassis, and is the card is held in place by one screw. What malfunctions on the vibrato boards? The first thing I would check is the vibrato speed and depth controls. I would spray some tuner wash or contact cleaner into the contact area of both pots and try readjusting each control. A dirty control could cause the vibrato to malfunction, and this is the easiest and first thing to check. The next most likely culprits are the three electrolytic capacitors on the vibrato board. One of these is 1000 uf (uf = micro farads), one is 25 (or 30) uf, and one is 10 uf, all rated at 25 volts. Electrolytic capacitors typically have a life expectancy of ten years, so forty plus years after their original installation on these circuit cards, these capacitors are prime candidates for replacement. 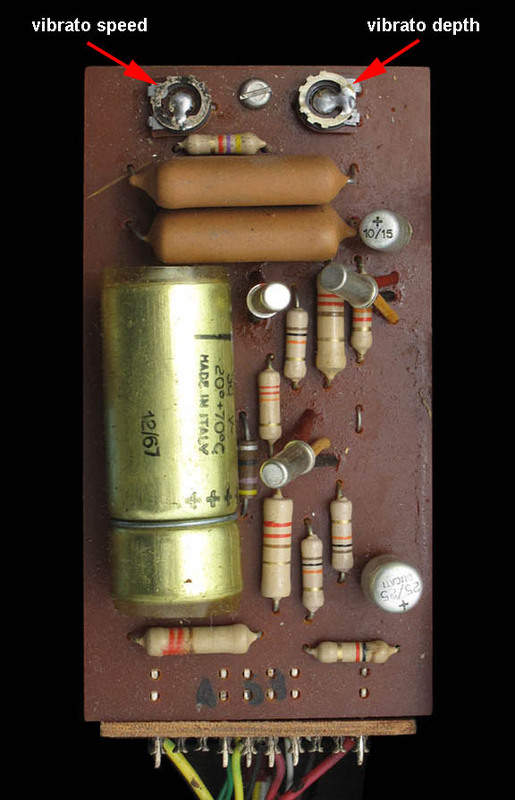 The capacitors needed for this repair are commonly available at a Radio Shack or Tandy. The replacement capacitors will probably have a 50 volt rating, but that will not be a problem. YOu may substitute a 22 uf electrolytic for the 245 uf part originally used. Please observe the location of the + end of each capacitor and install the replacements the same way. The cost to replace all three capacitors will be around $5. If changing these capacitors does not fix the problem, then one would next look at the three germanium transistors as the other part that is likely to fail. Marginal or defective germanium transistors often work momentarily after they are chilled. An easy way to diagnose this issue is to give a shot of "freeze spray" or "component cooler" (again available at Radio Shack for about $10) on each transistor. This should help reveal which of the three transistors is bad. Perform the transistor freeze test with the vibrato switch "on" and any key on the organ depresssed. 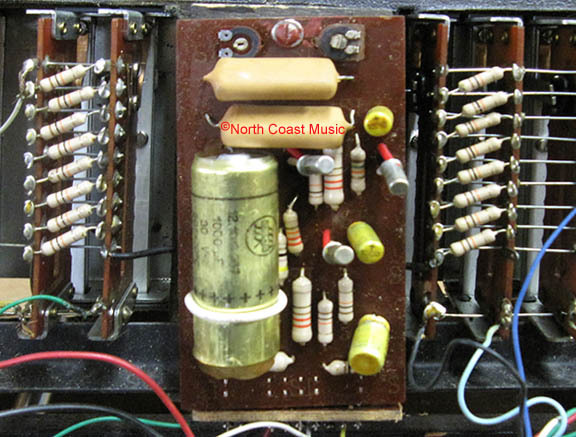 Listen for the vibrato to return as you freeze each of the three transistors. If you locate a defective transistor, any of the three on the vibrato board may be replaced with an NTE 102A from www.mouser.com. You might wish to purchase the Vox V303 schematic to help you repair the vibrato circuit. Parts values for all capacitors, resistors, and diodes are included in this schematic. Click here to purchase this from North Coast Music.